• By pasting in a graphic image from another application via the clipboard. • Click in a blank space in your Mathcad worksheet. • Choose Picture from the Insert menu. • Type the name of a matrix in the placeholder at the bottom of the operator. 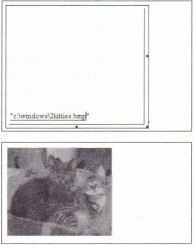 • Choose Picture from the Insert menu to insert the picture operator. 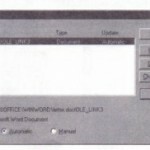 Each time you open the worksheet or calculate the worksheet, the bitmap file will be read into the picture operator. If you modify the source bitmap file, you must recalculate your worksheet to see the modified image. If you move the source bitmap file, Mathcad will not be able to display the picture. When you double-click on a linked OLE object, you activate the application that created the object and are able to edit the object in your Mathcad worksheet. 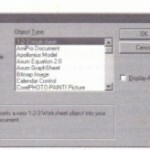 This section describes using the Paste Special command on the Edit menu to paste graphic images into Mathcad worksheets in noneditable formats: as pictures (metafiles) or bitmaps. A metafile, which is strictly a Windows graphic format, can be resized in Mathcad without undue loss of resolution, whereas a bitmap is usually viewed best only at its original size. A device-independent bitmap, or DIB, is stored in a bitmap format that is portable to other operating systems. • Place the graphics image on the clipboard, usually via a Copy command on the Edit menu. Many Windows applications have this feature. • Click the mouse wherever you want the image in your Mathcad worksheet. .Choose Paste Special from the Edit menu, and choose one of the available formats. 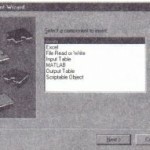 If you do not wish to paste a linked OLE object, choose “Picture (metafile)” or “Device Independent Bitmap” from the list in the Paste Special dialog box. • Click “OK.” Mathcad creates a picture region and puts into it the image stored on the clipboard. The format choices in the Paste Special dialog box will vary, depending on the application from which you originally copied a selection. 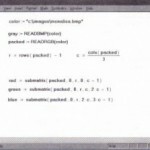 Mathcad stores the color depth-the number of colors in the image-at the time you paste it into a worksheet. 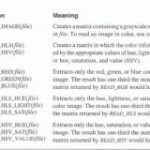 This means that you can safely resave any worksheets that contain color images on systems that have different color displays, either fewer or more colors. The images will continue to display at the proper color depth on the systems that created the worksheets. When you import directly from the clipboard, the picture information is stored as part of the Mathcad worksheet. This makes the document take up more disk space. It also means that when you copy the worksheet, the picture information travels along with it.